Here is a trendy favor that is environmentally friendly, useful and truly one of a kind! The 7 1/4" by 2 1/2" metal water bottles are personalized with your choice of more than 50 design and color options, as well as 3 lines of personalized text. The bottle has a glimmering silver metallic finish, a black screw-on top for a tight seal, and an opening to attach a clip or keychain. The bottle holds 400 ml/13.53 ounces and is a great choice for your eco-friendly event! So that I can gift bag each bottle. I give gifts to each mom at my church on this special day. Ive choosen your company this year. Will you be able to get them to me by that date. Im willing to cancel the personalization and except plain if this will help me to get my order sooner. Please respond ASAP please. Thank you so very much. You can enter your zip code in the delivery time section to check if rush/expedited shipping is available and see if it can be shipped before 5/10/2019. Is it possible to order an assortment of these water bottles with different designs, chosen from the design options on them, but then all of them would include personalized text? For example, 30 bottles with the 'We Need Each Otter' design, 30 bottles with the 'Head Tomatoes' design, and 30 bottles with 'Great Pear' design. Then each would have 'John and Jane, April 01, 2019' printed on them. Yes, you can order 30 each with their own design. However, the prices on our site are based on each item being exactly the same, so you would need to enter 30 to your cart for each new design. Please let us know if you have more questions by calling our Customer Service team (866 998 9595) or finding us on LiveChat. One design per order. cannot mix designs. if multiple designs are needed, then a separate order will need to be placed, one for each design. set up feee's will apply to each order. Can I increase the font size for personalized water bottles? I'm sorry, the font size of this Personalized Metal Water Bottle Favor can't be adjusted. Hi is there any way that I can upload the artwork? This is for a work event and we want to put our logo on it. Only the design options listed on our site are available. I'm sorry, we're not able to accept other images, photos or logos for these Personalized Metal Water Bottle Favors. Is there an option to have a school logo and the school name and year? Hi Rhoda, unfortunately we do not have the updated price of this Personalized Metal Water Bottle Favor as it's currently out of stock until February 4, 2019. Yes, I'm buying a water bottle and just asking: I'm not married, so can I scratch off the love-related phrases as shown in the picture? Or just buy them without the phrases? 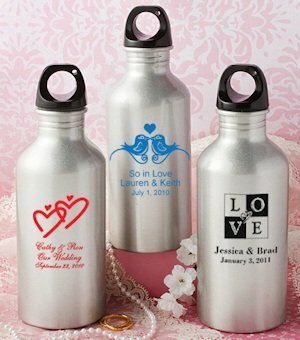 I'm sorry we can't scratch off the design of the Personalized Metal Water Bottle Favors but you can select other designs listed in our designer tool, we have some generic designs that might suit your theme. Can I add a logo to the customization? I'm sorry, only the design options listed on our site are available; we're not able to accept other images, photos or logos for these Personalized Metal Water Bottle Favors. 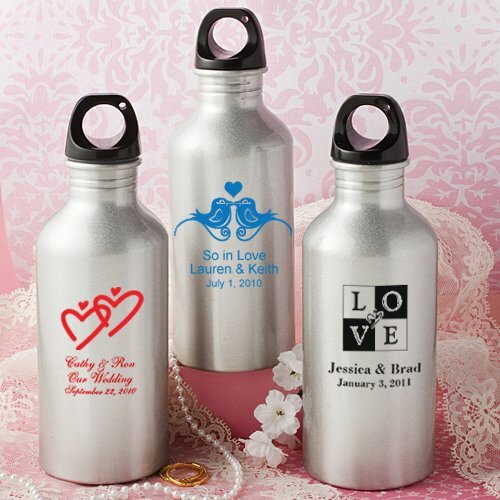 Are these Personalized Metal Water Bottle Favors stainless steel? They are not; they're metal with a silver metallic finish. Do these Personalized Metal Water Bottle Favors need to be washed before using? Are they dishwasher safe? For any of our screen-printed items, we recommend hand washing only and to do so before use. Can I purchase these without personalization? Unfortunately, the Personalized Metal Water Bottle Favor really includes a personalization. The bottle has a glimmering silver metallic finish, a black screw-on top for a tight seal, and an opening to attach a clip or keychain. The bottle holds 400 ml/13.53 ounces and is a great choice for your eco-friendly event. Can I purchase the Personalized Metal Water Bottle Favors without personalization? Yes, but since they're set up to be personalized, you will have to make those selections during the checkout process. Please reply to your order confirmation (which you'll receive within 5 minutes from the time your order is placed) to let us know you'd like them to be blank. We'll revise your order and email you a new confirmation showing that update. Hi I'm doing my own design with my own text. What do I pick? What "bottle design" do I pick? I chose no design and I want to make sure that's correct. Only the designs listed on our product page are available. You will have an option to choose one or do no design at all. If you choose the Custom Headline/My Own headline option, then select “My own Text” for the design option. You can enter that on the monogram line and then you will have line 1, 2 and 3 for the text. Make sure that you complete the design mode as this will be your proof and you do have to sign off on this. I want to order a sample of this water bottle but the link keeps glitching? Please refresh the page of the Personalized Metal Water Bottle Favors, then enter 1 qty and your zip code, and click add to cart. You will not be able to personalize it; it will just be a random sample. I'm not familiar with the different fonts, how can I see the font styles? After adding the Personalized Metal Water Bottle Favors to your cart, you need to click on view designer tool which can be found under Personalization after clicking on Complete the missing info. Click the font tab above and select from the drop down list and try them one by one by typing something on text line 1, 2 or 3 to see how the font looks like.